I am a sufferer of oily skin, and I believed for a very long time that I would not be able to pull of a ‘dewy face’ look, well I was wrong. Heres my take on a dewy face for oily skinned people out there. I know what you’re thinking, this is a matte foundation? Well I think if you have oily skin, starting off with a mattifying foundation is key. This foundation isn’t incredibly matte either, even though it states it is. So don’t be alarmed. Its a wonderful product and gives a medium to high coverage and I find really helps to control the oils around my T-Zone, especially my nose. 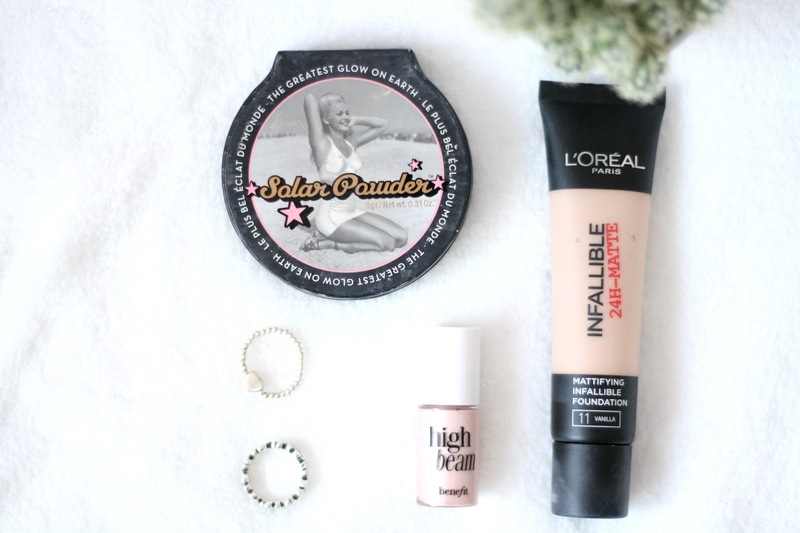 One of my favourite bronzers. One side of this is a bronzer and the other a powder/highlight shade. This is perfect for oily skin, because its a powder so won’t make you look shiny at all. By swirling this two colours together on a big fluffy brush, you should get the perfect glowy bronzed look. Just sweep this up your cheekbones, and voila! This is where the dewy look really takes form. I love this highlighter because you can make it as subtle or as bold as you feel and in no way does it make you look shiny and oily. Just dab this across the tops of your cheekbones; where you’d normally highlight and then use your ring finger to pat it and blend it in. Also you can take this down the centre of your nose if you want too. This look really works well for me and I do suffer with very oily skin. I hope this is helpful to some, and I’d love to know if anyone gives it a go! Do you have any tips for dewy looking skin?